“EVO”- the most beloved instrument of guitar icon, Steve Vai. Commemorating 25 years of his signature guitar, the JEM, we proudly introduce the JEM-EVO, a real masterpiece made possible by the highest Japanese craftsmanship. 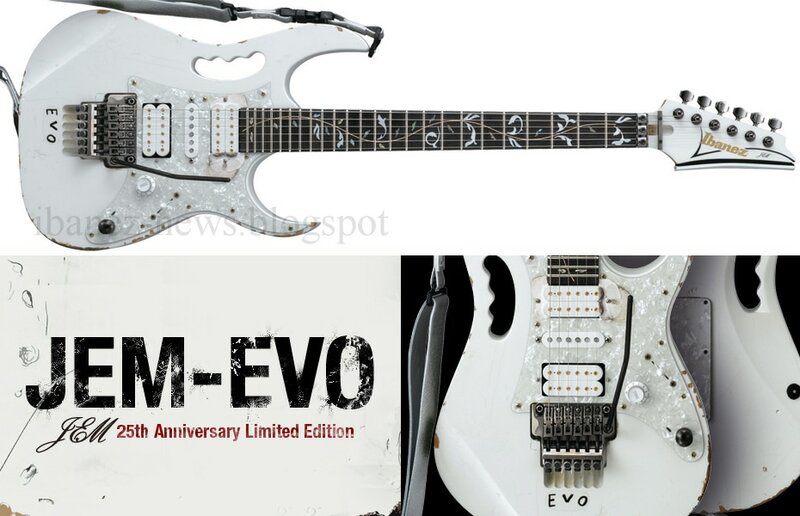 Instead of just modifying a regular production model, all of the components of the JEM-EVO; body, neck, everything- has been made from scratch specifically for this commemorative model. JEMEVO - EVO is arguably the most iconic JEM of all and has been Steve's first choice for recording and touring since 1993. It has recently been retired to the studio to save it from road demolition, but is about to be resurrected from the grave. Steve will be getting a new EVO, and 100 more will find their way into the hands of those willing to drop the coin. The 25th Anniversary of the JEM will be celebrated by exacting recreations of the most recognized JEM in history. Built by Sugi, these will also be the finest JEM's built to date, and as true to the originals as possible, right down to "reproducing" the neck joint crack that has sent her into retirement. [It is just simulated, there will be no worry your EVO will break into 2 pieces!!}. 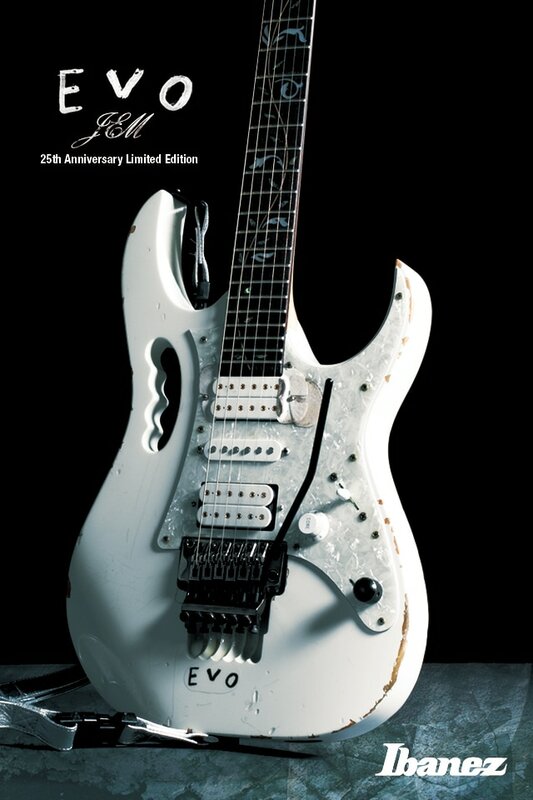 Steve will be signing the back of each "Steve Vai - 1 of 100", and writing "EVO" beside the claw, just like the original. The necks will bear the correct serial number sticker of the original, as Sugi impresses the actual serial numbers into the end of the fretboard. I miss the green "KNOX" tape on the neck pickup from previous tours, but it is a recreation of EVO as it is currently and not from any other recognizable previous incarnation. This project began with mapping all of the scratches and dents of the actual “EVO”. Steve feels that each nick and scratch in EVO “add character and tell stories,” so every single one of them is important and has been re-created by hand. All the dents on the body, belt buckle wear, and scratches around the input jack, are all there, just like EVO. The original EVO has unfortunately developed body cracks at the neck joint after being Steve’s main guitar for over 20 years, both on tour and in the studio. In order to preserve durability and function, these body cracks have only been aesthetically recreated on the JEM-EVO, retaining the look of the original EVO while avoiding the actual cracks that EVO has. The neck has been made based on Steve’s EVO. All of the shapes and dimensions (and even the serial number on the back of the headstock) are exactly the same. The smoothness of the EVO neck is nothing short of amazing. Due to Steve’s wild signature moves on stage, EVO has been forced to experience various repairs and surgeries from time to time, and the JEM-EVO faithfully recreates this look. The current EVO neck was installed in 1997, when the previous one was broken during a show in Melbourne, Australia. This is why the headstock doesn’t seem to have as many marks and chips as the body features. JEM-EVO features DiMarzio® Evolution ® pickups, the same pickups as in the regular production JEM models- with some twists, however. The neck pickup on JEM-EVO (and Steve’s own EVO) is actually one normally mounted in the bridge position. To fit the polarity, it is mounted upside down. Other features include a tremolo cavity plate fastened to the body with Velcro, gaffer’s tape on the sides of the neck pickup to prevent the strings from getting caught underneath the pickup, the original Edge tremolo, the Back Stop which supports the tremolo system and something that Steve prefers on all of his guitars, a pick holder on the side of the headstock, the “name tag” on the side of the body, and a wrench holder on the back of the headstock… just to name a few. 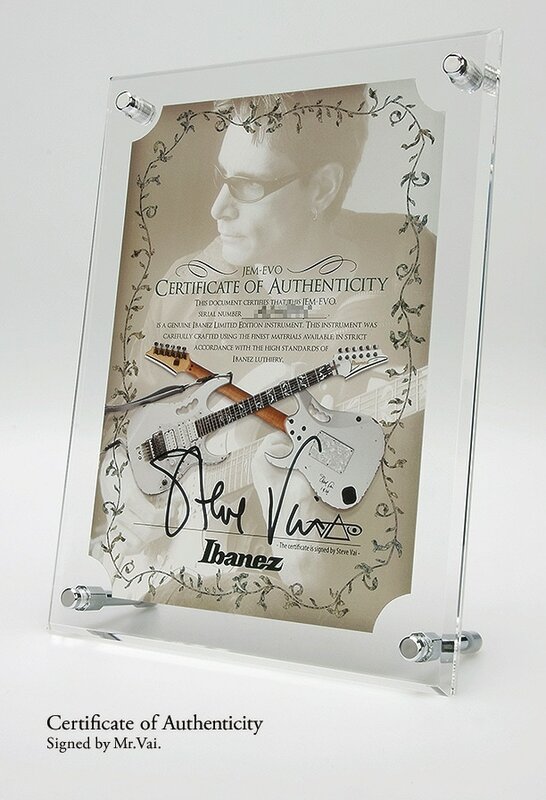 The final touch has been added by Mr. Vai himself - his autograph on the back of the body, in the same location where Steve’s own EVO was autographed by the late Les Paul in 1995, when Steve attended Mr. Paul’s birthday party. JEM-EVO is installed with a chrome leather DiMarzio ® ClipLock ® strap, which is currently discontinued, but have been specially reproduced for this project and unavailable anywhere else. Also included is a Certificate of Authenticity with Steve’s signature. Only 100 JEM-EVO guitars have been produced. Here’s your own chance to add to the history of EVO. Got an Ibanez jem 20TH Anniversary for sale? Get a quick offer in 60 seconds! Released 2012 Limited to 100 editions only. Ultra Rare!